i wanted to go somewhere. I woke up this morning to a message from my mother, sent sometime in the middle of my night while I slept in Sydney. Imagine that! she wrote, followed by some red hearts. Attached were two photos of a typed-up assignment I'd written, dated April 17, 2007 — almost exactly ten years ago. 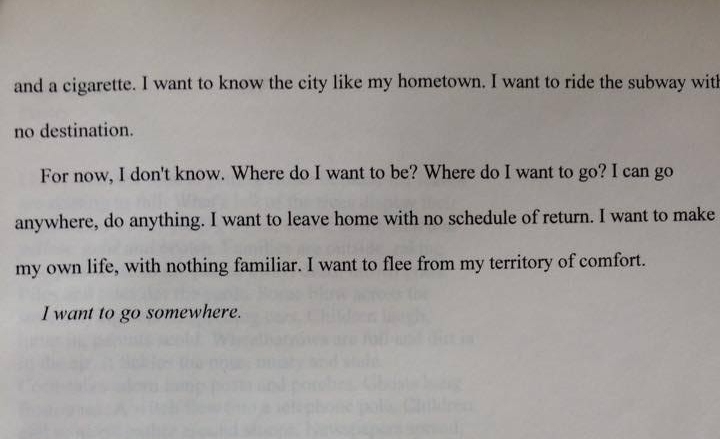 I Want To Go Somewhere, I'd titled it, written for English 146, my creative writing class sophomore year of college. She wrote that I should look at the second page, and included a close up of the very end. Through my tired eyes, I blearily read the piece. At the second page, I was struck. For now, I don't know. Where do I want to be? Where do I want to go? I can go anywhere, do anything. I want to leave home with no schedule of return. I want to make my own life, with nothing familiar. I want to flee from my territory of comfort. Three months before I'd traveled to Haiti for ten days, my first real time out of the country. (Canada barely counted, I hadn't even needed a passport.) Nine months later I'd be en route to South Africa for a semester spent studying and interning in Cape Town. And almost exactly ten years later I'd be living in Australia, having gone anywhere I wanted, having left home with no scheduled return, making my own life with nothing at all familiar. I certainly fled from my territory of comfort, and went somewhere. Sometimes I lament the fact that I have no plan, that I have nothing solid ahead of me to look towards, that I'm sort of just floating out in the world with no tether at the age of almost-30. I know that in a lot of ways that must seem so freeing and adventurous, but it can be stressful in a lot of ways too. And yet it's exactly what I called forth into existence, beginning ten years ago. I laid in my bed shocked at the uncanniness of such a piece of writing, one of those moments where time and space seem to collide and you're living each separate experience as one and the same in the present moment. I had a visceral sense of that decade-ago girl, the one who planted the seed for the unconventional life I'm currently living. The seed is where it all begins. Sometimes years and years sooner, a little breadcrumb forms and the spark of aliveness leads you to the next breadcrumb, and the next. In my case, the seed had to be planted and tended to and protected for almost ten years. But thank goodness my 2007 self planted it.